The region of Provence is renowned for its stunning landscape and this tapestry "Provence" shows the most famous mountain in the region, the Sainte Victoire mountain. The Sainte Victoire was made famous by the fact that several well known artists painted it because of its beauty, including Cezanne who could see it from near his house and painted it frequently. Also there was Picasso who bought the Chateau de Vauvenargues near the base of the mountain range and set up a studio there between 1959 and 1962. 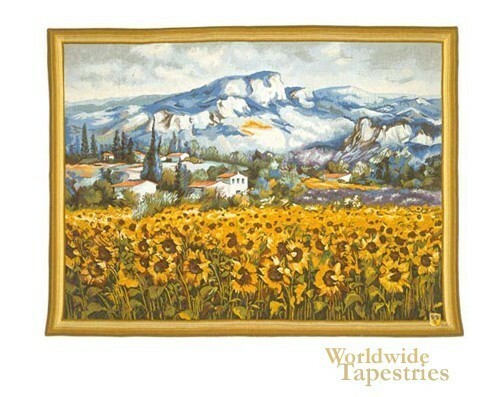 In this tapestry we see the distinct rolling mountains and their rocky formations, with the ever present poplars of the region and a stunning array of wild sunflowers in the fields between us and the village. There is a brilliance of color emanating from the flowers, the lavender fields and imposing mountains in the sunny scene that reflects the striking beauty of this region of France. The French are renowned for their great landscapes in the Southeastern region and Provence is a pristine example of this beauty. This landscape tapestry "Provence" is backed with a lining and has a tunnel for easy hanging.